Surgical technique has progressed significantly in the past 100 years. However, the old medical adage See one, do one, teach one is sadly still very much part of every surgeon’s professional life. The learning curve is extremely steep and most learning and improvement in technique happens ‘on the job’. Most surgeons learn on dead, plastic or live bodies; none of these are idea for learning! The World Health Org estimate that 5BN people WW don't have access to any surgery! 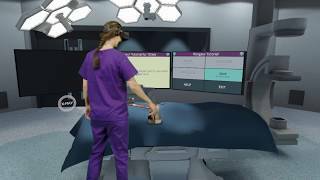 Our mission is to democratise surgical training and put it within arms-length of surgeons worldwide using XR technology combined with haptics (the sense of touch) to create a low-cost, highly effective simulation platform. The project is to create a revolutionary SaaS platform combining virtual reality and haptic (the sense of touch) software simulations that for the first time delivers surgeons a place where they can safely practise procedures, be measured and receive feedback on their performance and repeat this as often as they wish. It takes in medical experts from across the globe, universities and college/teaching hospitals. The Surgical Haptic Intelligence Engine (SHIE) we have built is without doubt the biggest innovation. The system allows us to model and replicate the interaction between multiple devices with multiple tissue types and scenarios. This involves a layered haptic development process as we have to model both the feeling and actions of tools (such as a drill, saw or scalpel) as well is how this feels when it interacts with other elements (hitting bone, soft tissue etc). This type of real-time 3D haptic modelling work has never been undertaken before. The net result of this is that the project is allowing us to build a haptic roadmap of the human body which, in time, we plan to release for developers to use. Our approach is to be completely hardware agnostic and therefore we are building SHIE to allow us to move between various haptic devices so that as haptic gloves and other haptic arms become widely available our system will support them.